A backyard grill does not have to be big to be good -- if you're ready to make the jump from hibachi to full sized grill, the Weber One Touch is as far as you need to go. The first impression may not be great, but this very popular American-made design often wins over even doubtful new owners. The One Touch has some very good features, and some that I wish were better. The heavy gauge plated steel kettle is durable and definitely will last for years. The depth of this kettle shape allows slow cooking of whole poultry and other large cuts of meat. Unlike some smokers with space for meat but not fire, it holds enough charcoal for thorough cooking; food sits far enough above the coals to cook without charring. Vents and ash removal systems are simple and effective, with vanes of aluminum that won't rust away in the first season. The things I'd like to see improved involve what's below the kettle, which is heavy (a total weight of 34 pounds is mostly kettle). 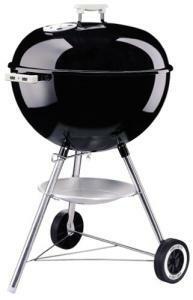 The grill sits on a very lightweight tripod stand that should be placed on a stable and flat surface. On bare ground, the leading leg of the tripod may sink and cause the grill to tip. It's not a project you want to finish with a fire already burning. The ash removal system works great, but the collection system is a shallow aluminum bowl. It won't hold much, and there's no wind protection, so expect ashes to miss the bowl frequently. It's a good thing to do after you're sure the fire is out.